A classified stakes over ten furlongs on the all weather at Newcastle, is today's Race of the Day. Ian Williams, who runs Gabrial The Terror, has been in excellent form over the past month, as can be seen from the green 30 below his name. If you click on the black trainer icon below the horses name, you can view this in more detail. 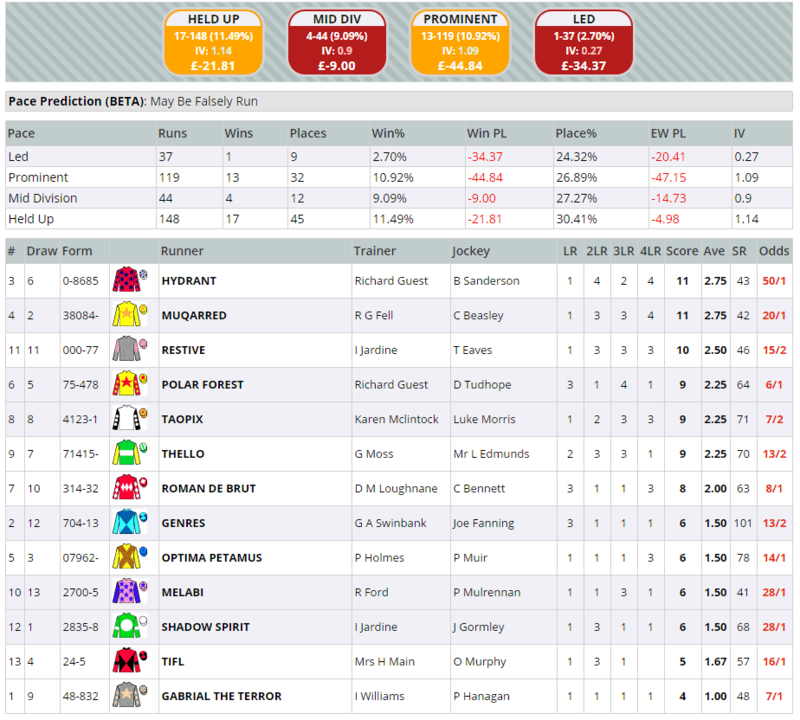 He's had 11 winners (23.91%) and 19 places (41.30%) for level stakes profits of 40.18 and 36.08 respectively, proving his is very profitable to follow currently. Paul Hanagan takes the ride, and his form has been useful recently as well, whilst he also boasts very good course form. It is interesting to note that Genres has a far higher Speed Rating than anything else in the field. He has a mark of 101, with the next closest being on 78. The Shortlist is free to all users on a Tuesday, and it is an excellent report for highlighting runners with a good chance. Roman De Brut makes The Shortlist on the 'place' setting, with a perfect score of 15. At a price of 8/1, he definitely appears to be worth a closer look. 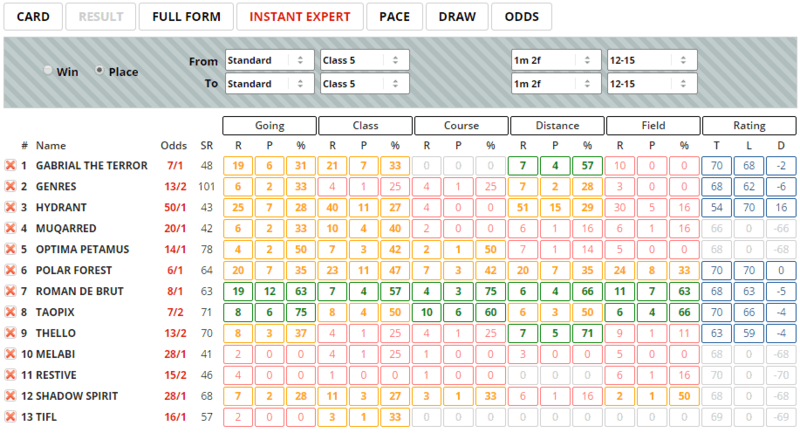 Looking at the Instant Expert tab, we can see confirmation of the impressive line of green for Roman De Brut. He is five pounds higher than for his last win, therefore a bold showing looks well within his capabilities. When switched to the 'win' setting, Taopix looks good. He has two sections of green and three of amber, showing his is pretty consistent in these conditions. 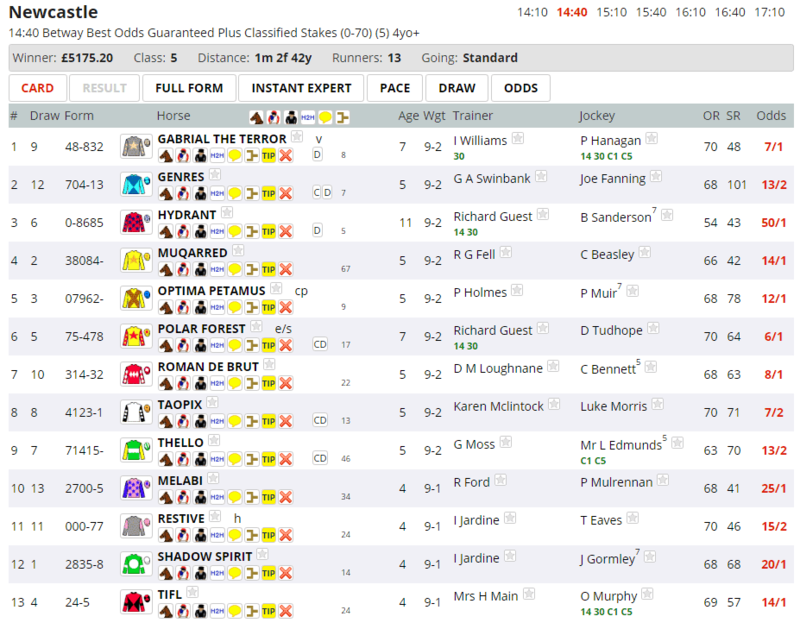 He was a winner last time out running on well over 12 furlongs, so he will need to be sharp back over this shorter trip. Horses that are help up off the pace have the best record here over this distance. There isn't a huge sample of races to go on when looking at the pace tab, but they have won 11.49% of the time. It is quite tricky to ascertain who is going to make the running, as although both Hydrant and Muqarred have the highest pace score, they were both slowly away last time out. Gabrial The Terror looks certain to be held up by Paul Hanagan, where he will look to bide his time and try and pick them all off when he gets the opportunity.